Coal reserves are available in almost every country worldwide, with recoverable reserves in around 70 countries. At current production levels, proven coal reserves are estimated to last 147 years. However, production levels are by no means level, and are in fact increasing and some estimates are that peak coal could arrive in many countries such as China and America by around 2030. Coal reserves are usually stated as either (1) "Resources" ("measured" + "indicated" + "inferred" = "resources", and then, a smaller number, often only 10-20% of "resources", (2) "Run of Mine" (ROM) reserves, and finally (3) "marketable reserves", which may be only 60% of ROM reserves. [clarification needed] The standards for reserves are set by stock exchanges, in consultation with industry associations. For example, in ASEAN countries reserves standards follow the Australasian Joint Ore Reserves Committee Code (JORC) used by the Australian Securities Exchange. Improvements in mining methods (e.g. longwall mining), hazardous gas monitoring (such as safety-lamps or more modern electronic gas monitors), gas drainage, electrical equipment, and ventilation have reduced many of the risks of rock falls, explosions, and unhealthy air quality. Gases released during the mining process can be recovered to generate electricity and improve worker safety with gas engines. Another innovation in recent years is the use of closed circuit escape respirators, respirators that contain oxygen for situations where mine ventilation is compromised. Statistical analyses performed by the US Department of Labor's Mine Safety and Health Administration (MSHA) show that between 1990 and 2004, the industry cut the rate of injuries by more than half and fatalities by two-thirds. 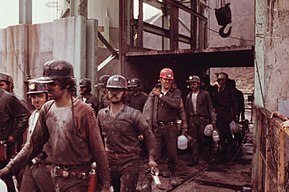 However, according to the Bureau of Labor Statistics, even in 2006, mining remained the second most dangerous occupation in America, when measured by fatality rate. 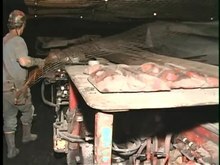 [verification needed] However, these numbers include all mining, with oil and gas mining contributing the majority of fatalities; coal mining resulted in only 47 fatalities that year. 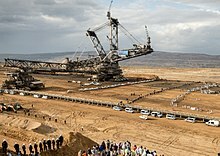 Wikimedia Commons has media related to Coal mining. 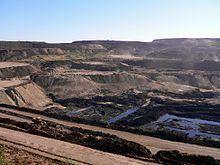 Look up colliery in Wiktionary, the free dictionary.